The first White Lions to be discovered was in 1975 on the Timbavati Wild Reserve, South Africa by Chris and Charlotte Mc Bride. “In the extraordinary place, an oasis in a world of disappearing and endangered species, what appears to be a new strain of lions has suddenly emerged. And for once, man, responsible for the destruction of so much wildlife, is in a position to use a whole battery of new and sophisticated techniques to protect and to foster these unique animals – the White Lions of Timbavati. This is where Wiets Safari’s is entering into the picture and need the backing of your Chapter and SCI. 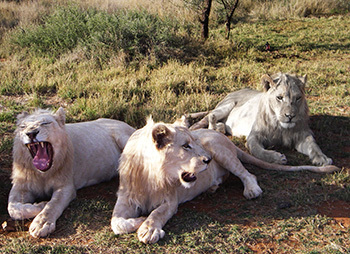 Wiets Safaris has exported White Lions to Italy and the UK where a breeding program will be started in 2008.